Over at Splitcoast today the Ways to Use It Challenge is using vellum. I’ve hoarded this vellum in my stash for quite some time, and decided this was the perfect time to use it. Vellum can be difficult to adhere to your card. What I chose to do was cut it about 1 1/2″ longer than the card front and I folded it over on to the back of the card. I used my ATG gun to adhere it on the back and it hardly shows at all. The cardbase is a standard A2 in Stampin‘ Up’s new Pool Party, available July 1st. I actually stamped a very faint grid pattern on it before adhering the vellum piece. Next came the chocolate colored Zva Creative pearls. I’ve cut it apart and used one long piece diagonally across the card, used a swirl in the corner and then a small strip on my vellum butterfly. 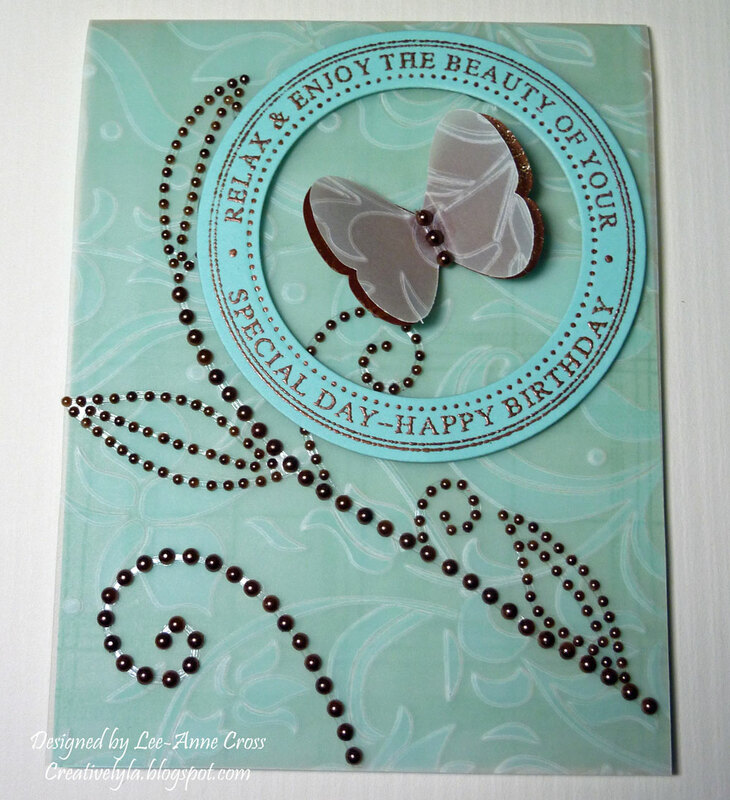 The butterfly is just two layers, one of a scrap of heat embossed paper for a card gone terribly wrong. It’s good to keep your oopsies around; you never know when it will work with something else. I didn’t want to hide the vellum so chose to do an open sentiment treatment. It’s been stamped and heat embossed. Then cut with nesties and popped up on glue dots. So the lesson for today…dig through that stash of your prized papers and use them! And hang on to those oopsies, they may come in handy some day! LOL! This is gorgeous….I haven't even opened my pack of new In Colors yet, but I can see Pool Party paired with Choc Chip is going to be a big hit! Your embellishments are stunning!